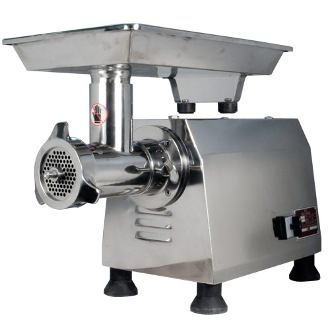 Our #32 Electric Meat Grinder with a mirror-polished all Stainless Steel Construction (including tray) on the motor housing gives it a sharp and professional look. Equipped with a 2 HP, 1500 Watt motor compatible only with a 220V connection and has a net weight of 148 lbs. ; the specs are as impressive as its output capability (705 lbs. of meat per hour). Easily removable and attachable head makes cleaning up this behemoth electric meat grinder quick and easy. Also included is a 3/4" Stuffing Tube, 1 Chopping Knives, a Meat Pusher, a 1/4" (6mm) Grinding Plate and a Stainless Steel 5/16" (8mm) Grinding Plate with Hub (making removal and insertion easier). An absolutely substantial electric meat grinder that is sure to be the hallmark of your butcher or sausage shop, or meat processing kitchen. • Net Weight: 148 lbs.